Wondering what to pack in your hospital bag for labor and delivery? You don’t need as much as you probably think. 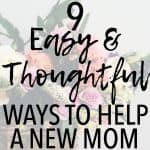 As a mom and nurse, I’m sharing a checklist of things that you won’t want to forget! As you’re working your way through your third trimester checklist and all of the to-dos before baby arrives, you’ll inevitably get to the point of packing your hospital bags. Many new moms pack so much that it looks like they are moving into the hospital. As a nurse, I think it’s important to only pack the essentials. 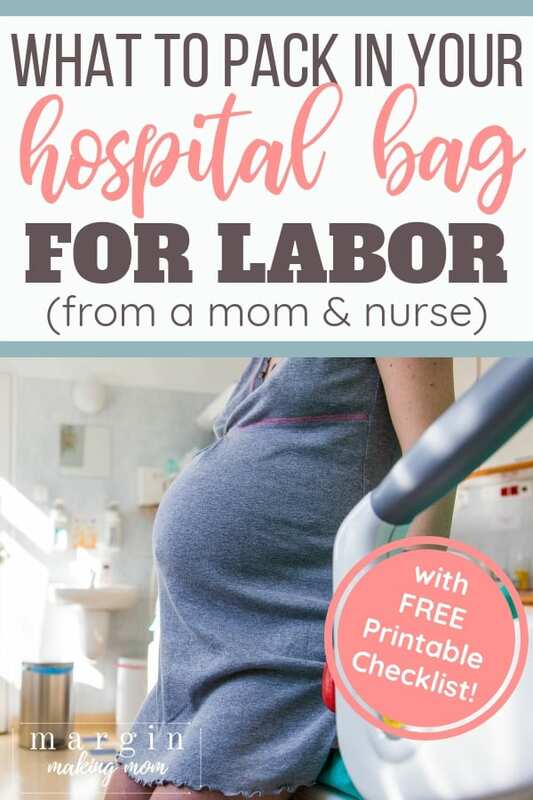 Not only that, but I’ve found it can be really convenient to pack a bag for labor and pack another separate hospital bag for after the birth (plus a hospital bag for dad!). That’s because there is some stuff you won’t really need during labor. Likewise, there’s some stuff you won’t need after the baby is born. There’s no point in carting around everything the whole time you’re in the hospital. In many hospitals, you deliver the baby in one room and then transfer to another hospital room for the rest of your stay after the baby is born. Trust me, you don’t want to carry around a bunch of luggage you don’t even need. When you first arrive to the hospital, you’ll have to register. The registrar will want to make a copy of your ID and insurance card, so be sure to have those handy. You can always send these items home with your spouse or support person later if you don’t want to keep up with them, but you’ll need them when you check in, even if you pre-register. Depending on how long your labor lasts, you may need to have a phone charger handy, so it’s a good idea to pack one. Or, you could use an external battery to keep it charged. You’ll definitely want your phone (or your partner’s phone) to be in working order so you can snap photos of the baby and send updates to friends and family. Unless you are a skilled photographer, I don’t recommend bringing a fancy camera to the hospital for your baby’s birth. These days, phone cameras are actually pretty impressive and get the job done well, or a simple point-and-shoot camera would work fine. But, if you have a nicer camera that you or your spouse are pretty good at using, go ahead and bring it, and check out these tips for taking photos at the hospital. This seems small, but if your hair is long enough to be pulled back, you’ll probably want to have a hair tie handy. It’s just a nice way to keep your hair out of your face, especially if you start to get hot and sweaty. It’s also a good idea to tell your husband where this is, so he can get it for you if you want it. Another small but mighty item! First of all, hospital air will dry you out fast. But you’ll also be doing a lot of breathing during contractions, and that dries out your lips, too. Pack some of your favorite lip balm (this kind is my absolute favorite–I keep a tube everywhere! ), and also let your husband know where this is ahead of time, so he can find it easily when you need it. I bought an inexpensive pair of comfortable but cute nonskid slipper-socks, similar to these, for each of my babies’ births. I wanted to have something on my feet that kept me from walking barefoot around the hospital floor (I’ll be honest, hospital floors gross me out). But, I also wanted something that I wouldn’t be totally devastated if they got covered in blood. This isn’t a total necessity, as hospitals do have socks, but they are usually rough and not the most comfortable. So having my own was a nice little luxury. Many women are fine with going bra-less during labor, but some women find they need some extra support to feel most comfortable. It doesn’t hurt to have a soft but supportive bra with you, but I’d recommend it not be your favorite or most expensive one, since it could get messy (and preferably one without an underwire, in case it needs to be cut off if things go south). Something like this is ideal! I personally didn’t use a robe during labor, but many women like having something that feels a little more luxurious than just the hospital gowns. While this isn’t an absolute necessity (you can always wear an extra hospital gown backwards, as a robe, to cover up your back door), if you want to have your own handy for when you’re up walking around, go for it. I would recommend bringing something inexpensive, that you won’t mind if it gets messy or ruined. I like this soft kimono-style robe as an inexpensive option. So, #truthtalk here, hospitals do provide some toiletries. But they probably aren’t what you’re used to. It’s usually a basic bar of soap, a standard toothbrush and small tube of toothpaste, roll-on deodorant (though some hospitals I’ve worked in don’t have deodorant at all ), and baby shampoo. Again, depending on how long your labor is, you may not need any of these items at while you’re in labor and delivery, but if you do, you will very likely want your own. Some women like a relaxing massage during labor, so you may want to also bring some lotion or massage oil. Use a toiletry bag to pack some of your own toiletries, which will help you feel more like yourself and more at home. I recommend a hanging toiletry bag like this, because counter space is often very limited (or nonexistent) in hospital bathrooms. If you have eyeglasses, bring them with you. Even if you normally wear contacts, bring your glasses (and your contact lens case and solution) in case you need them. Plan to bring some things to keep you in a good head space. Bring items that could serve as distractions, such as books or magazines. I also love the idea of having affirmations that you can read or that can be read to you during labor, reminding you of how strong and capable you are and how amazing your body is. If you enjoy music, bring some along. My husband created a playlist of relaxing music and played it for me during labor, which was wonderful! Also, if you created a birth plan, bring that along. Hopefully you’ve already discussed it with your provider, but it can be helpful to give a copy to your nurse as well. I recommend leaving most of your valuables at home, so you have less to keep track of, and so nothing disappears. In most cases, you also don’t need to bring any medications from home. Bring a list of any medications or supplements you take, but the actual medicines can stay at home, because the hospital will give you medications from their supply (the exception to this would be if you take an uncommon medication or specific brand that the hospital may not stock, which is fairly unusual–in this case, consult with your provider ahead of time to sort out how to handle this, as hospitals have varying policies and procedures for this). 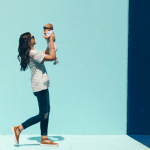 Also, while there are certainly more things you might want to have during your hospital stay, those are things you can pack in your postpartum bag, your diaper bag, or in dad’s bag. You don’t want to have several bags and pillows and such to keep up with as you move to different rooms during your hospitalization. Having the essentials handy will help you feel a bit more comfortable and more at home, without the hassle of bringing a bunch of things you won’t need! 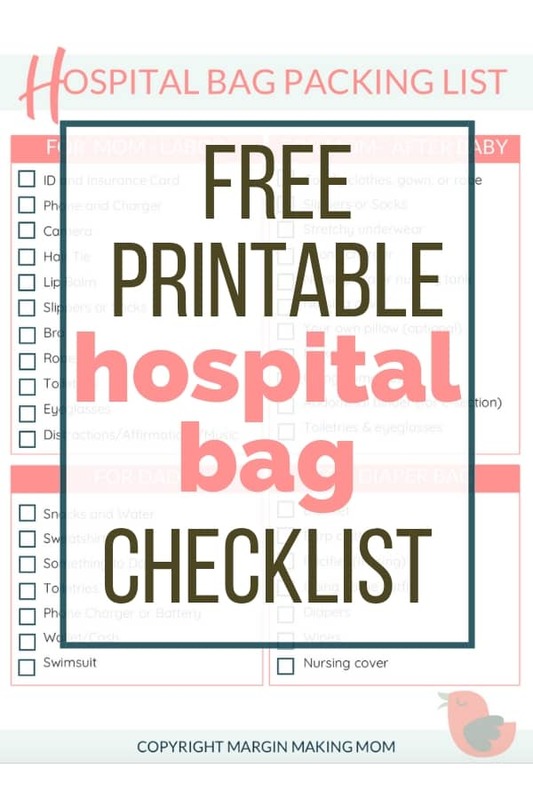 Fill out the form below to grab a copy of my third trimester checklist and hospital bag checklist to make sure you don’t forget anything important! Note: This information should not be considered medical advice or an alternative to advice from your medical professional or health care provider. As always, if you have questions related to your specific situation, I recommend seeking the expertise of your provider.